- Custom sizes, shapes, and full bleed edge to edge printing available at no extra charge. 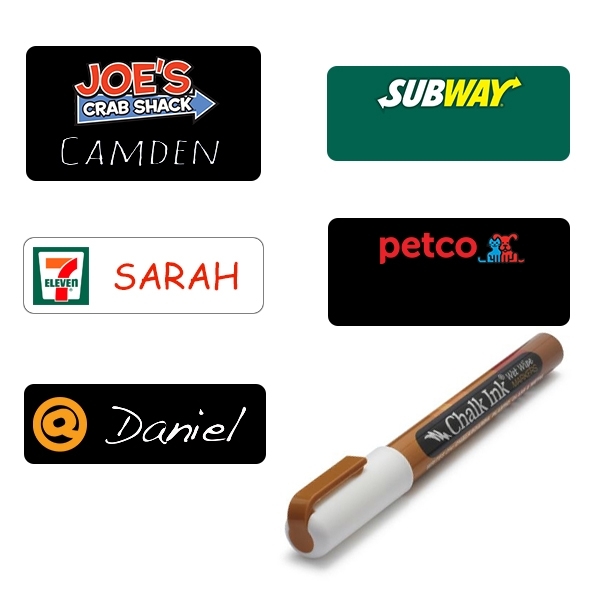 Our logo only full color digitally printed chalkboard name badge comes on chalkboard black, green, or white. Standard sizes listed. Our name tags come on a .060 (1/16"), extra thick and durable plastic. Prints are protected with clear coating and overlays. Production time is 1 - 5 days for most orders. Same day and next day rush available. Available in all common sizes including but not limited to .75" x 2.5", 1" x 3", 1.25" x 3", 1.5" x 3", 1.75" x 3", 2" x 3", 2 1/8" x 3 3/8"
Custom sizes available at no extra charge. Badges larger than 2 1/8" x 3 3/8" will have oversize badge charge.